All evaluated reaches suffer from a lack of large woody debris, and sediment levels in essential riffle habitat regularly exceed ODFW benchmarks. Pool area is good, and may become a vital habitat resource in the face of advancing climate change. 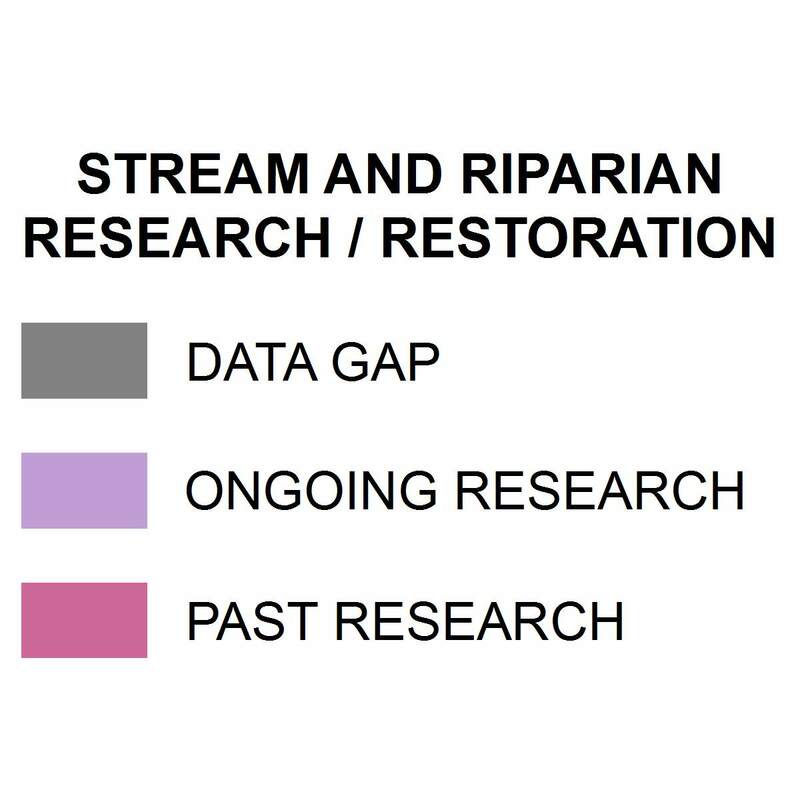 This Chapter includes a single data summary: Stream and Riparian Habitat in the Lower Coos Watershed– which describes the most current status and trends of important stream and riparian habitat attributes including pool area and residual pool depth, large woody debris (pieces, volume, and key pieces), gravel and sediment in riffles, road-related sediment and bank stability, and riparian cover type and percent shade. Data used in this chapter came primarily from Coos Watershed Association (CoosWA) reports (CoosWA 2006, 2008, 2011) and survey work (Cornu et al. 2012), and from Oregon Department of Fish and Wildlife (ODFW) surveys conducted between 1998 and 2013. Each of these sources addresses a different part of the lower Coos watershed, and they bear enough similarity in methods and analyses to be largely comparable. The CoosWA surveys took place on selected reaches in various Coos watershed sub-basins and were intended to be indicative of the status of entire sub-basins. The ODFW surveys were disbursed throughout the Coos watershed. 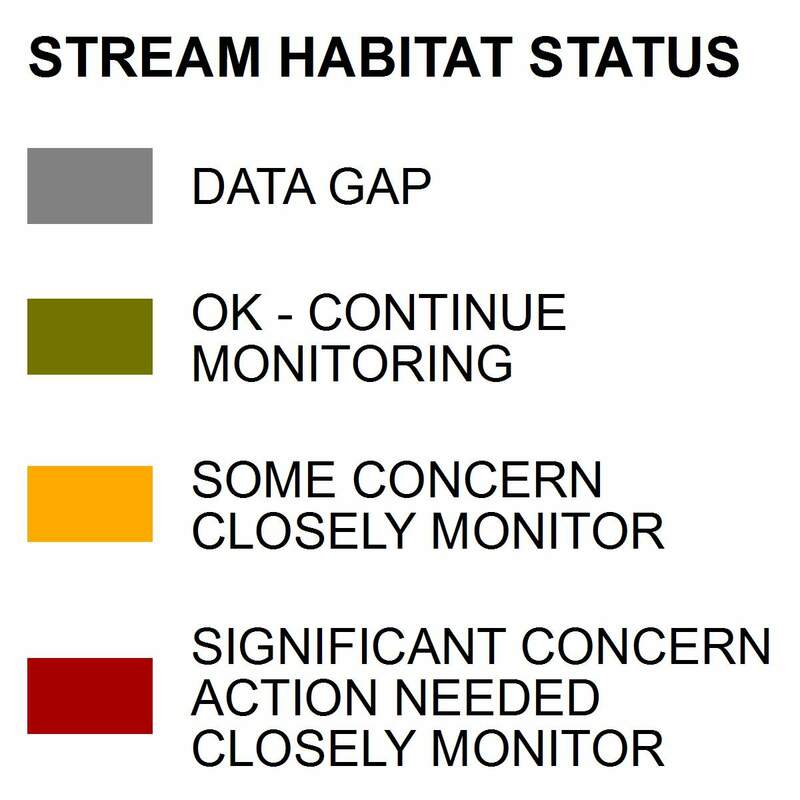 The stream and riparian habitat summary relies heavily on data gathered from Coho habitat surveys. Due to the species-specific nature of the surveys, data gathered may be less applicable to other species of concern, such as lamprey or sturgeon, which may thrive in conditions different from those beneficial to salmonids. Studies summarized in this document are not necessarily evenly distributed through time and space. This reflects the limited resources of researchers and occasionally limited access to various areas of the Coos watershed (especially private property). Additionally, the units of study employed in these reports are stream “reaches” which vary in length, making comparisons difficult. Surveys also do not comprehensively cover the entire watershed; the area west of the North Slough sub-basin and the upper reaches of the watershed, in particular, are not addressed in the CoosWA surveys. Finally, the ODFW summer habitat surveys go back to 1998, and it is possible that conditions in the reaches surveyed have changed over the duration of the study and that these changes were not taken into account. There are factors that should be taken into account when using the Habitat Limiting Factors Model (HLFM) to evaluate the condition of a watershed (Nickelson 1998). 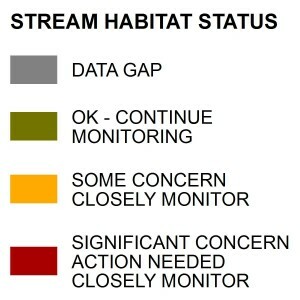 In the first place, the HLFM relies on data from both summer and winter habitat surveys. As stream habitats are typically surveyed during the summer, Nickelson was forced to develop a multiple regression model to predict winter habitat capacity from summer habitat data. HLFM estimates of winter habitat, while statistically robust, may therefore not be based on actual winter survey observations. The HLFM also implicitly assumes that winter habitat is the primary bottleneck to salmonid smolt production, and assumes that salmonid survival rates from Coho egg deposition to summer parr (large juvenile salmonid, between a fry and a smolt) is 7.2% for all reaches at full seeding (the number of wild Coho in a spawning population that produces the most juveniles a habitat will support). Furthermore, the model designer notes that during 1990-95, the correlation between estimated habitat quality and observed salmon in the Coos basin was not as good as in other Oregon coast basins. Nickelson (1998) attributed this phenomenon to lower exploitation rates and better marine survival conditions during this period. These factors should be taken into account when considering the results of HFLM in the Coos watershed. Finally, not all of the assessments evaluate the same factors which can hinder comparisons. Of particular note, only 9 of the 15 evaluated sub-basins addressed in this assessment were subject to the HLFM, and only 7 had their potential and actual shade modeled using the SHADOW model. This means that while common sense might suggest that conditions similar to those portrayed by the models are prevalent to some degree throughout the watershed, there is not necessarily either documentary or model evidence to support such an assertion. What is more, the observable variation in conditions between individual reaches means that while models and averages may reflect large patterns in habitat quality, any given reach may be very different from its neighbors, and from model results. Cornu, C. E., J. Souder, J. Hamilton, A. Helms, R. Rimler, B. Joyce, F. Reasor, T. Pedersen, E. Wright, R. Namitz, J. Bragg, and B. Tanner. 2012. Partnership for Coastal Watersheds State of the South Slough and Coastal Frontal Watersheds. 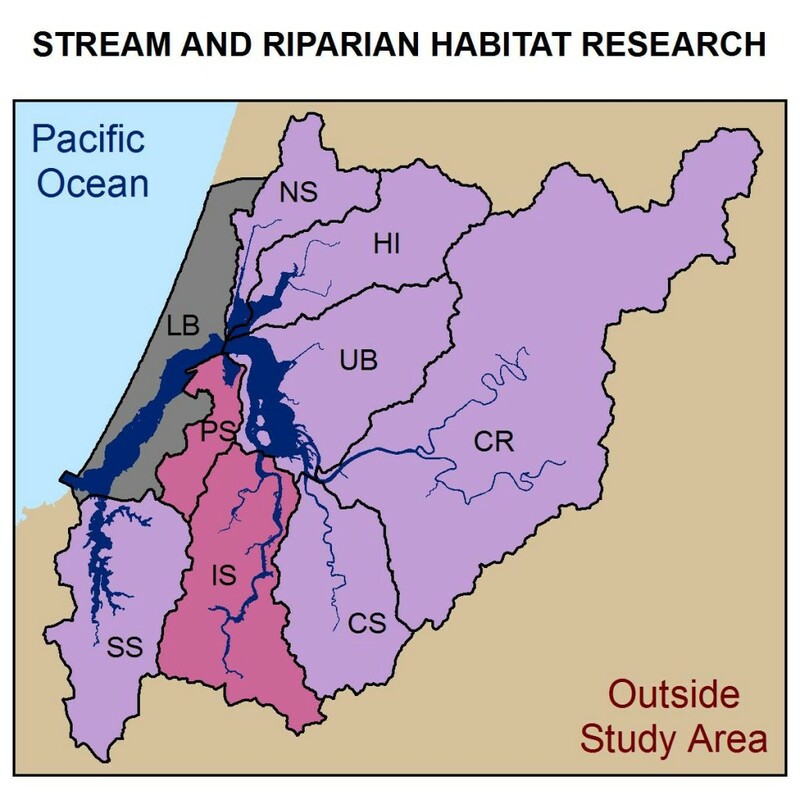 Report prepared for the Partnership for Coastal Watersheds Steering Committee, South Slough National Estuarine Research Reserve, and Coos watershed Association. pp. 225. Nickelson, T. E. 1998. 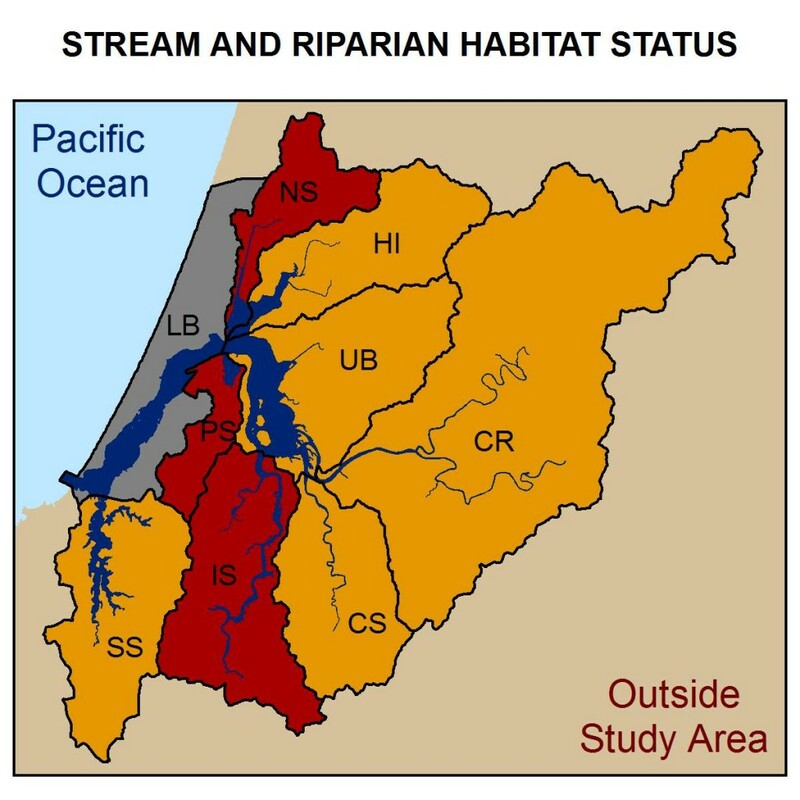 A habitat-based assessment of coho salmon production potential and spawner escapement needs for Oregon coastal streams. No. 98. Portland: Oregon Department of Fish and Wildlife.